I was lucky enough to secure a front row seat for Suzanne’s author panel. In order to achieve this feat, I arrived over an hour early to the ballroom. Not surprisingly, I was not the first to arrive and claim a seat (or 5). Although the room was huge, every seat was filled within the hour. Suzanne took the stage quietly, setting her notes on the podium. 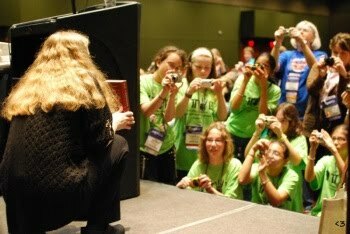 A swarm of people (librarians, moms, children of all ages - both male and female) came to the stage for a quick picture. Suzanne was kind enough to grab a copy of the hunger games and pose on bended knee. The flashes were reminiscent of a red carpet event in Hollywood. She posed for roughly ten minutes; pointing to her gold mockingjay necklace and asking quick questions. One lady asked, “Do you feel like a rock star?” Suzanne answered, “yes!”. She stayed in position until a representative asked that we take a seat so Suzanne could begin her presentation. We all followed suit and took our seats. After a few kind words from a Texas Library Association Young Adult Roundtable committee member, Suzanne took the stage to hoots, hollers, and a huge round of applause. She was very humble, thanked her audience and began. Suzanne began with a slide show of her upbringing and her early career. Suzanne began as a playwright then spent 19 years in children’s television. She has written for LITTLE BEAR, CLARISA EXPLAINS IT ALL, OSWALD, and THE MYSTERY FILES OF SHELBY WOO. During this time, she met James Proimos who basically talked her into trying her hand at writing books. Her first endeavor with publishing was THE OVERLAND CHRONICLES. This set of 5 books were always classified “first and foremost, a war story”. Themes deal with rescuing a POW, biological warfare, and finally the necessity of military intelligence of winning a war. At this point, Suzanne backtracks into her fascination with conflict and war. Suzanne was a military brat. Her father was in the United States Air Force serving in Vietnam. At the age of twelve she realized that she thought of war more than the average teenage girl. For her 12th birthday, her family took her to the site of Napoleon’s defeat. She explains that it wasn’t the “true” site of his defeat, but chosen because of the massive hill. Today, a statue of a lion stands at the top of the hill. This hill is comprised entirely of soldier’s helmets and the surrounding soil. Suzanne goes on to share stories of her and her father’s talks of war. In 2003, just before our country entered war yet again, her father died. The first OVERLANDER book was published in the same year. Years later, Suzanne was channel surging late at night. She was flipping back and forth between a reality television show where young people were completing for money and coverage of the war in Iraq. 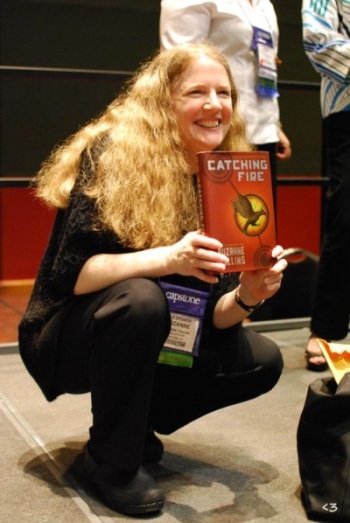 She explains, “…after a while, the lines began to blur.” This was the birth of THE HUNGER GAMES. 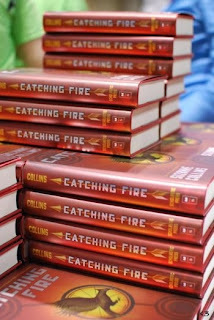 Suzanne ended her discussion by reading the last few pages of CATCHING FIRE. The entire room was on the edge of her seat and perfectly silent. 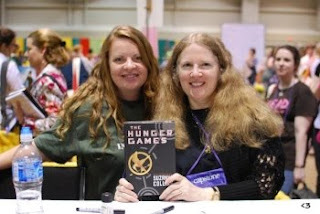 Most (not all believe it or not) knew how the story would end - in a “shameless cliffhanger”, but hearing Gale say, “There is no District 12” from Suzanne was (for me) a dream come true. Preface by saying there was no moderator on the floor during this time. Almost all questions were asked by young adults. Where did you come up with the names for the characters in THE HUNGER GAMES series? Wanted to pick traditional Roman names and add a little more to “jazz it up”. Rue is an acient flower that fit her agricultural district. Thresh was taken from the word threshing - a process before a harvest. What was your favorite part to write in THE HUNGER GAMES? What was your favorite book as a teenager? If were a District, which one would we be in? Definitely the Capitol! We know where our next meal is coming from and we are spoiled. We have free speech and much too privileged. Where did you come up with the Mockingjay? Have you considered writing a prequel to THE HUNGER GAMES? “I haven’t ruled it out”, but I am busy with editing for Mockingjay. There are definitely no plans right now. When will THE HUNGER GAMES movie come out? Which book is your favorite book? (speaking @ HG), I look at each book as a 1-act play that make 1 tale. Oh my gosh, 90s flashback: CLARISSA and SHELBY WOO! If those shows ever go into syndication, I'm gonna scan the credits for Suzanne Collins' name! Oh man, I've got to start this series pronto. Thanks to your pal for sharing! I finished Hunger Games on Christmas morning and went on a huge scavenger hunt that day to find the sequel. All the bookstores were closed (which was good), so I had to wait until the next day (which was bad). Love Collins!